Immigrating to Canada from their home in Reading, a large town in Berkshire England the McMurdy family eventually settled in Winnipeg. The young Gordon McMurdy grew up in the St. Vital area located in the South center of the city. Attending first Machray Public school then high school at St. John's Technical School, were he had many friends in the close knit area of St. Vital. He played hockey well enough to be part of the Winnipeg Junior team. At completion of his high school year he worked in the private sector, then joining the air force in 1940. He completed his flight training and received his pilots wings at No.7 Service Flying Training School (SFTS) at RCAF Fort McLeod in March of 1941. He was posted to the newly opened No.15 SFTS at Claresholm Alberta instructing students on twin engine aircraft such as the Cessna Cranes and Avro Ansons. In December of 1942 he applied for and received a posting overseas. With the rank of Flight Lieutenant he completed his stints in O.T.U. and No. 1659 Conversion Unit and was posted to 419 squadron On June 21st. he and his crew did not have to wait long before they were in action. Within hours of arrival McMurdy was listed on the Battle Order of the nights of June 22/23 and June 24/25 as 2nd. Pilot . Arriving back in the early hours of the 25th , he was to again take part in operations that very night. Leaving base at shortly after eleven p.m. for Gelsenkirchen he and his crew were on their first squadron operation. S/L McMurdy's fifth operation to 419 squadron's frequent target Essen was one of two brushes with enemy flak. On this operation S/L McMurdy was introducing new arrival F/S Perkin to squadron operations, Perkin on board as 2nd . pilot felt what it was like for an aircraft to be hit by flak on his very first outing. The blast tore out the bottom of the rear gun turret, luckily the rear gunner Sgt. Peterkin was not injured. The flak was noted as being heavy over Essen, other aircraft crews reported that their runs on the target which had to be made through two rows of searchlights as "all hell breaking loose". The newly promoted S/L McMurdy and his crew were lucky the damage was light enough not to hamper their flight back to base. The attack on Essen had proved difficult, and the squadron had sustained no losses due to the flak. What did happen was one of those tragic accidents that were not that uncommon while aircraft were on the run into the target. Halifax JD256 VR-A, a member of McMurdy's "A" Flight after completing it's bomb run was damaged by something falling from above and tearing into the tail section, the damaged controls threw the aircraft into an inverted dive. In this inverted position the crew were unable to get into their chutes and escape the aircraft, only the pilot who had been wearing his chute managed to get clear. On the night of September 15/16 his Halifax was hit by flak over Mon Lucon, in fact three holes were punched through the starboard wing, and again his was the only aircraft hit by flak . 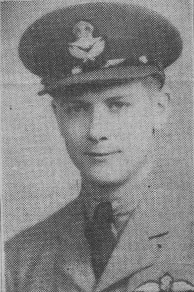 S/L McMurdy had two occasions during his time with the squadron to get away from flying and to be in charge of the whole squadron. When the base Group Captain went on Leaves, a temporary upward shuffle of personnel placed McMurdy in charge of the squadron. His abilities in this role did not go unnoticed and during the month of October he undertook the duties of Squadron Commander officially and with the rank of Wing Commander. The promotion and his new duties as Squadron Commander were well received by all aircrew and ground crew personnel. His appointment on October 11th found the squadron in a series of stand downs, during which time even with the new tasks as hand he took time out to complete to lectures to the squadron on how searchlights and flak acted together to cone and bring accurate gun fire on to aircraft.